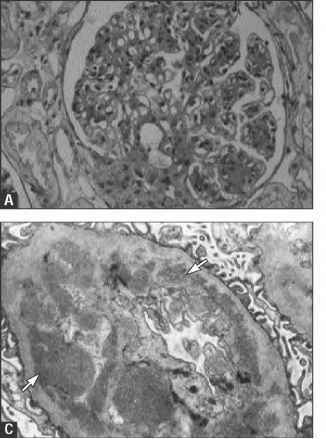 Light, immunofluorescent, and electron microscopy in nonamyloid fibrillary glomerulonephritis. Fibrillary glomerulonephritis is an entity in which abnormal extracellular fibrils, typically ranging from 10- to 20-nm thick, permeate the glomerular mesangial matrix and capillary basement membranes. The fibrils are defined only on electron microscopy and have an appearance, at first glance, similar to amyloid. Congo red stain, however, is negative. Patients with fibrillary glomerulonephritis usually exhibit protein-uria often in the nephrotic range, with variable hematuria, hypertension, and renal insufficiency. A, On light microscopy the glomeruli display widened mesangial regions, with variable increase in cellularity and thickened capillary walls and often with irregularly thickened basement membranes, double contours, or both. B, On immunofluorescence, there is coarse linear or confluent granular staining of capillary walls for immunoglobulin G and complement C3 and similar staining in the mesangial regions. Occasionally, monoclonal immunoglobulin G k deposits are identified; in most instances, however, both light chains are equally represented. The nature of the deposits is unknown. C, On electron microscopy the fibrils are roughly 20-nm thick, of indefinite length, and haphazardly arranged. 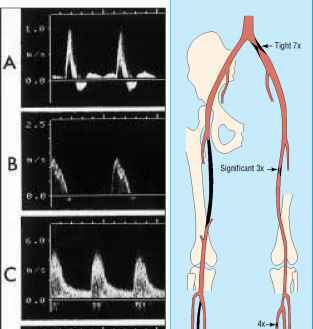 The fibrils permeate the mesangial matrix and basement membranes (arrow). The fibrils have been infrequently described in organs other than the kidneys. Light, immunofluorescent, and electron microscopy in immunotac-toid glomerulopathy. Immunotactoid glomerulopathy appears to be an immune-mediated glomerulonephritis. On electron microscopy the deposits are composed of multiple microtubular structures in subepithelial or subendothelial locations, or both, with lesser involvement of the mesangium. Patients with this disorder typically exhibit massive proteinuria or nephrotic syndrome. This glomeru-lopathy frequently is associated with lymphoplasmacytic disorders. 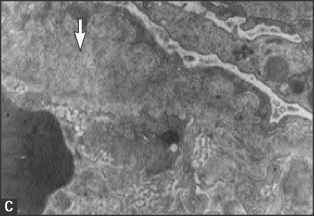 A, On light microscopy the glomerular capillary walls often are thickened and the mesangial regions widened, with increased cellu-larity. B, On immunofluorescence, granular capillary wall and mesangial immunoglobulin G and complement C3 deposits are present. The ultrastructural findings are of aggregates of microtubular structures in capillary wall locations corresponding to granular deposits by immunofluorescence. C, The microtubular structures are large, ranging from 30- to 50-nm thick, or more (arrows).